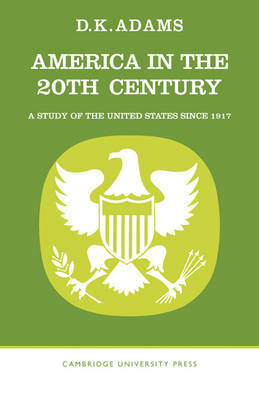 This book, originally published in 1967, traces the development of the United States in the twentieth century, paying particular attention to the years after 1917. At the time Dr Adams was already one of the leading British scholars in American studies and had done much to encourage interest in the subject. The book follows two main themes. One traces the change in America's place in the world from a position of isolation, and one suspicion of foreign entanglements, to its present role as leader of the western world. The second is the increasing initiative taken by the Federal Government in improving social conditions and ensuring civil rights for all citizens. There is a wide-ranging introductory chapter covering the period up to 1918, and accounts of the cultural and social background are included.